There are many beautiful and innovative ways to transform a wedding ceremony or reception. Flowers, lighting and balloons as well as little trinkets and ribbons. We have an extensive list of available items and are always happy (we actually encourage it) to speak with brides and bridegrooms about their own ideas. We can then go away and source the items you desire for your wedding. Below is a list of some of the more popular options we have available. We didn’t want to clog up the site with more, the possibilities are endless and we therefore strongly recommend you contact us to discuss your wedding ideas. Flowers are the most popular and perfect way to decorate your ceremony and reception venues. 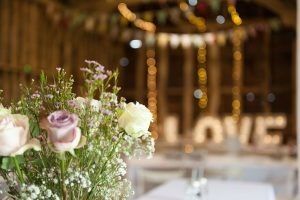 They are another key area of importance as it’s the bride’s way of putting her own stamp on the venue. Most brides will have a favourite flower and or colour which can be shown through a great floral display. 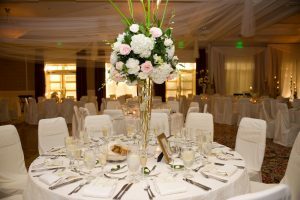 Flowers can be incorporated into many areas such as down the sides of the isle, on the back of chairs down to centrepieces, and even the cake. 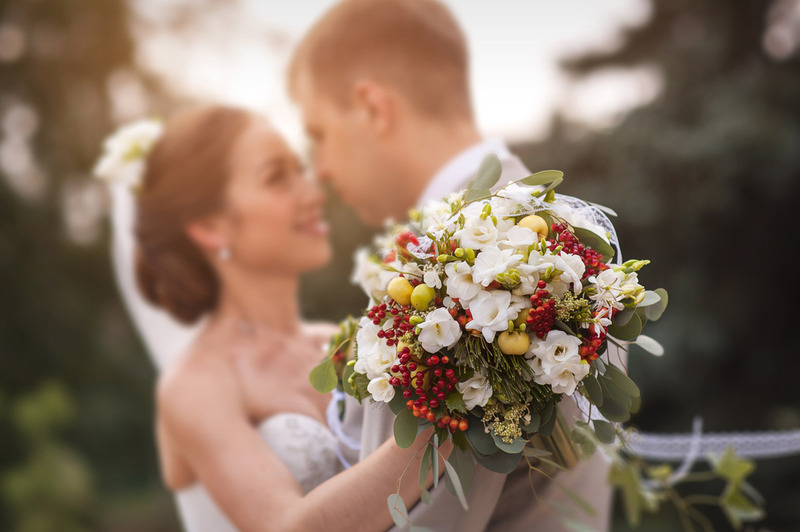 Most brides opt to hold a bouquet while they walk down the aisle, your bridesmaids could also have a bouquet to carry and it is traditional to order a selection of button holes or boutonnières to distribute throughout your wedding party, including the groom. Your first dance is going to be the dance that you will certainly remember for the rest of your life. It will also probably be the most photographed and filmed part of your life. With this in mind, many brides think about hiring a dance floor. We have a top of the range one for you to use. We can set up dance floors ranging in sizes up to 20ft x 20ft. They are finished in a beautiful glossy white and have hundreds of twinkling LED lights that can be set to white or a variety of colors. An LED dance floor is the ultimate way to instantly transform a wedding reception venue. At the foot of this page you will see a link to our Instagram page which has many pictures for you to browse through. 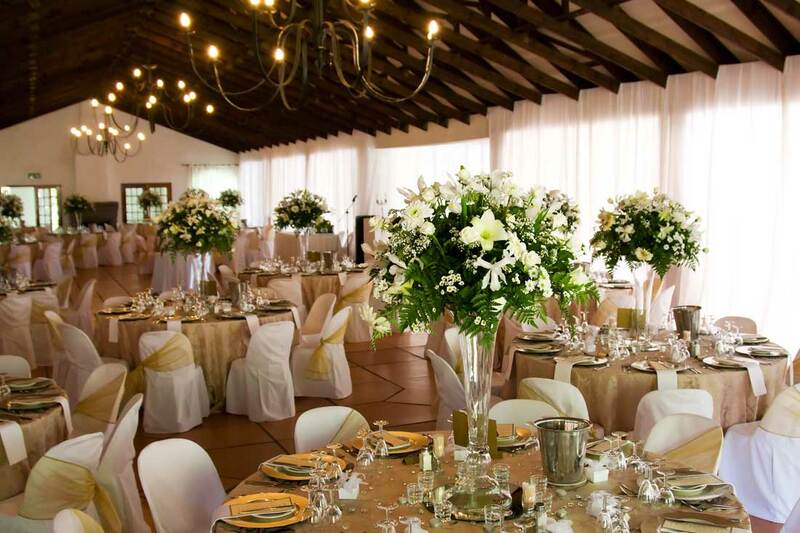 In our opinion this is one of the most important and economical ways to transform a wedding reception venue. It is one that is often overlooked which is a real shame. A few uplights positioned around the venue in the correct way really helps create the perfect mood for you and your guests. Uplights can be set to one colour or to change between alternate slowly. Our illuminated letters can be set out to spell MR&MRS, MR&MR, MRS&MRS or LOVE. They are 4ft high and have funfair style led bulbs which give off a vibrant light that is hard to miss. They are perfectly placed behind the head table or next to the dancefloor. Another fantastic option to help create that perfect venue mood. Almost every table at every wedding will have some sort of centrepiece. They can range from photos to edible items such as cheese boards or cakes. The most popular centrepiece in our experience is some sort of floral display. Again, we have an extensive catalogue of the various centrepieces on offer which include but are not limited to large Martini glasses, traditional vases and candlestick holders. 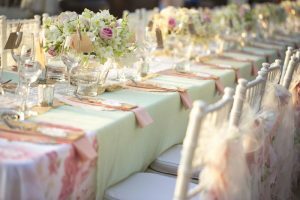 We can supply all your table cloths and chair covers which can include a colored sash or not. The colored sash is a great way to match your tables and chairs up to the overall colour scheme of the wedding. Contact us today for a quote on all your wedding needs.